You shall bring out much seed to the field but you will gather in little, for the locust will consume it (Deuteronomy 28:38). The locust shall possess all your trees and the produce of your ground (Deuteronomy 28:42). So, when the Jews started returning to their homeland in the 1890s, they did not find a land "flowing with milk and honey." 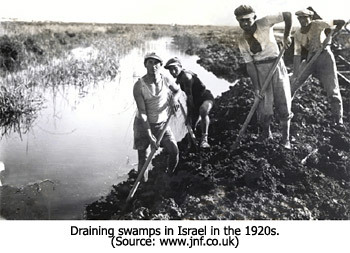 Instead, they were faced with trying to eke out a living in a desolate wasteland plagued with malaria-infested swamps. They paid exorbitant prices for the land, and the Muslims who lived there (people who considered themselves to be either Syrians or Turks) laughed all the way to the bank. 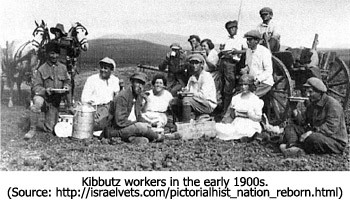 The Jews organized themselves into fortress-like communities called either a kibbutz or a moshav.27 These were collective farms that provided mutual help to their members and protection from Arab attacks. In the fourth and last part of this series on the restoration of the land of Israel, we'll look at how The Jewish National Fund was used by God to return the Holy Land from desolation to bounty in fulfillment of Ezekiel 36:34-35.